If you’ve been reading here for awhile, it’s no secret that I’ve been having a lot of fun decorating our baby girl’s nursery. I chose a monochrome color scheme and added a lot of personalized details to make the room perfect for our little lady. But, one nagging area bothering me was the flooring. We have builder basic carpet in the upstairs of our home, which doesn’t exactly scream “stylish.” We didn’t have much use for the upstairs bedrooms when we built the house 5 years ago (pre-kids! ), so we went neutral. 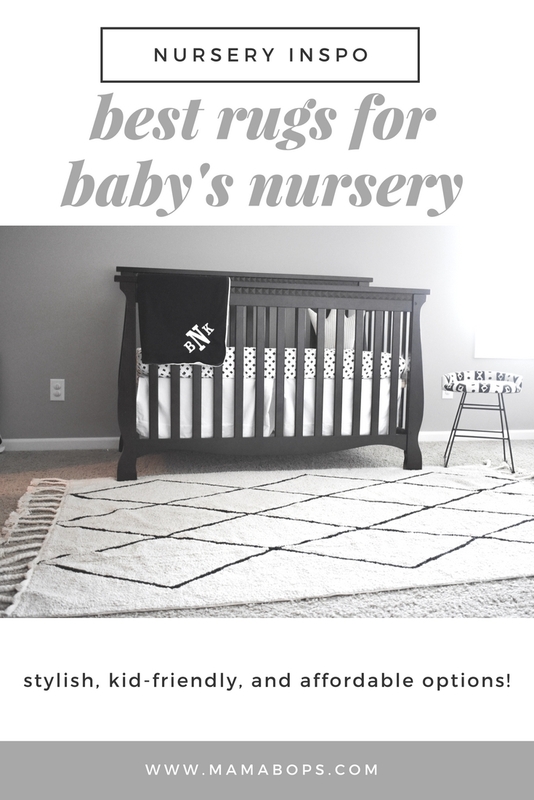 I wanted to add a fun rug to the nursery to make the floor fit in with the rest of the room’s decor. 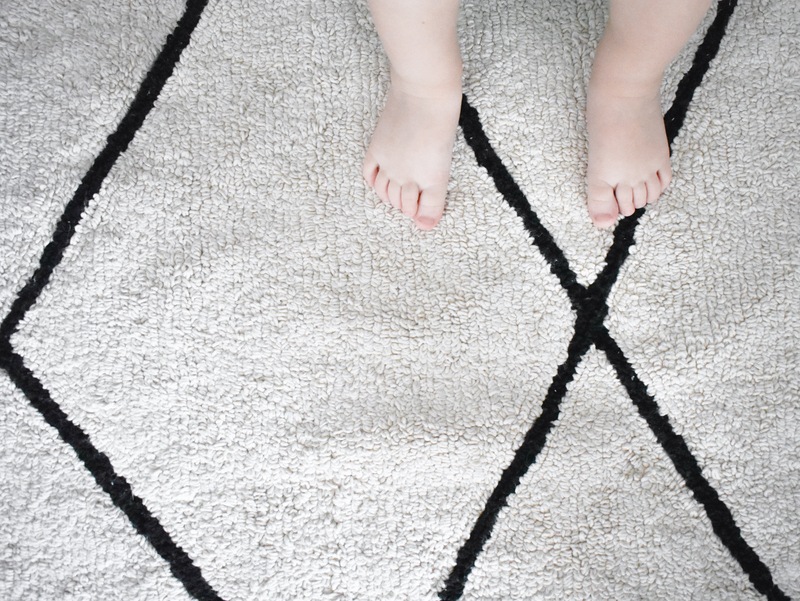 After some research on the best rugs for baby nursery, I found one that checked all my boxes! This beauty is the bereber beige rug by Lorena Canals. 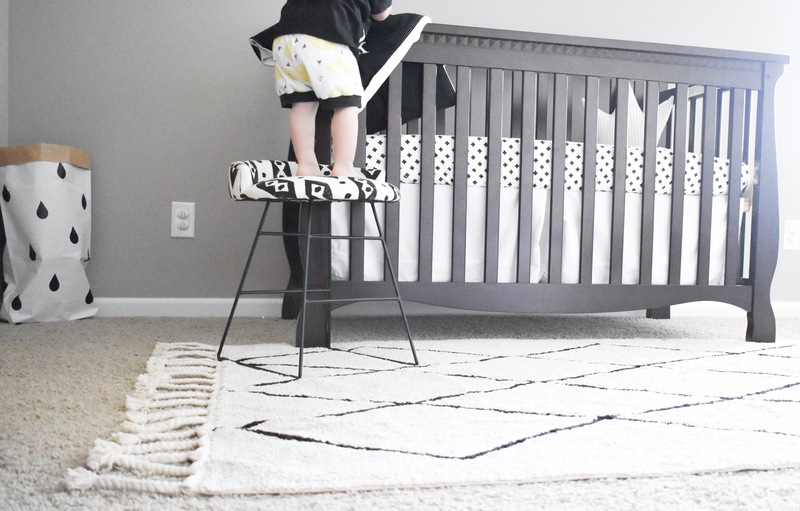 It is the perfect complement to our monochrome nursery! I love that it is chic enough to grow with our daughter or be used in other areas of the house. It fits in the nursery without having to be in the nursery, you know? One of my top nursery rug requirements is style. Even though I know the rug will have to hold up to baby (and big brother) messes, I still wanted something stylish. After all, the main point was to cover up the decidedly unstylish carpeting. I love the juxtaposition of the sophisticated neutral print with the fun braided tassels. Perfect for a modern nursery! 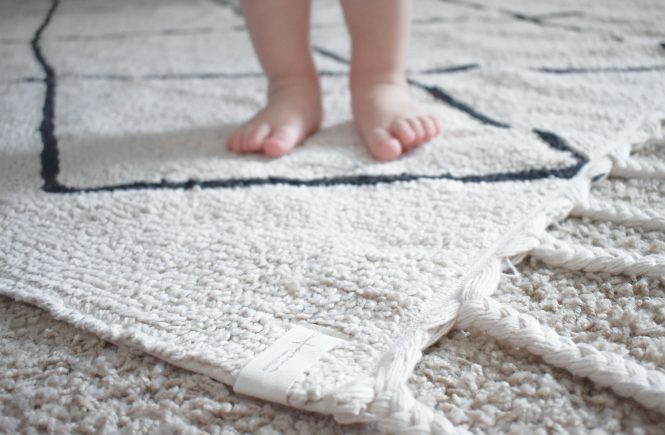 Of course, our baby nursery rug needed to hold up to everything that a baby and toddler will throw at it (literally). 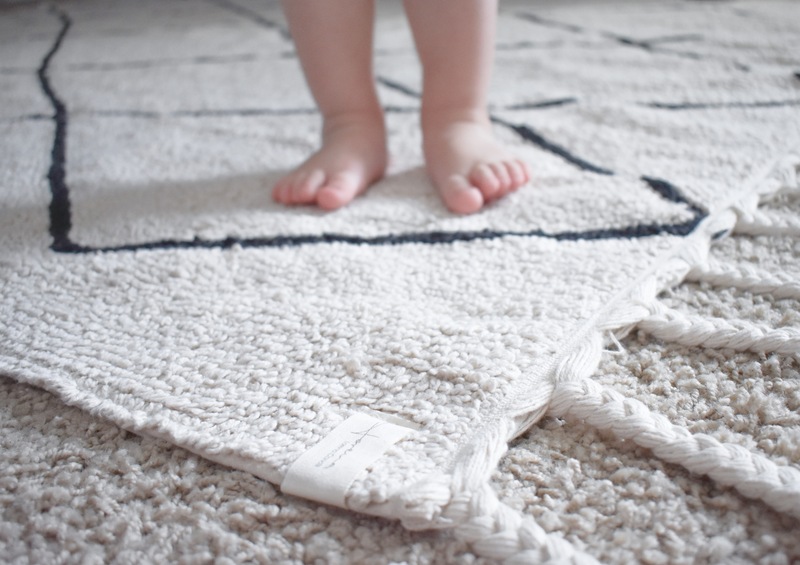 Lorena Canals are the best rugs for baby nursery because they are machine washable! When our rug inevitably picks up a stain, I’ll be able to easily take care of it right here at home. I also wanted a rug that would be safe for baby. 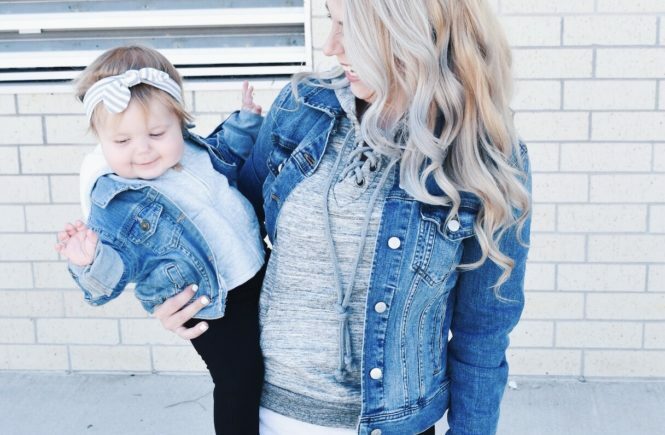 Becoming a mom makes you so much more aware of the products you buy and brands you support. I’ve written previously about my love for organic baby clothing and organic snacks. This rug fits perfectly into our lifestyle because Lorena Canals rugs use the best raw materials and natural dyes. 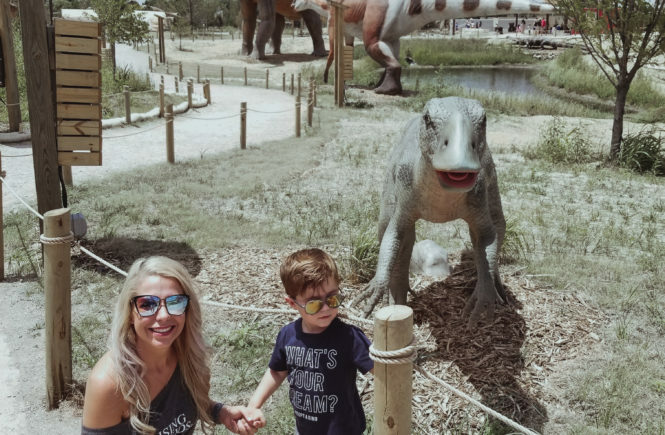 As a mom, I’m far from perfect… but I’m doing my best to make quality choices on products in my children’s lives. After all, I don’t want to think of any harsh chemicals or dyes lurking around while my boy plays. While I was taking this photo, he kept shouting at me, “I roll! I roll!” He loves to tell us what he is doing… rolling, jumping, running, chasing, anything! I don’t think little boys ever run out of energy. I’m curious to see how our little lady’s personality will be different (and what parts will be the same!). I can imagine my two little ones sharing hours of playtime in here. Starting with tummy time on this soft rug! I’ve been talking to Colton a lot lately about what his baby sister will be able to do when she is born. He is shocked that she won’t even be able to hold up her own head. But he says he’s excited to teach her how to do everything he knows how to do. And I’m so excited to see him step into his new role. He is such a nurturer that I think being a big brother comes naturally to him. There are so many times that I look at Colton and still see a baby. It will be so crazy to see him next to a newborn, because to me, he still is my newborn. The room is coming together and my little guy is practicing his big brother watch duties. It won’t be long now! 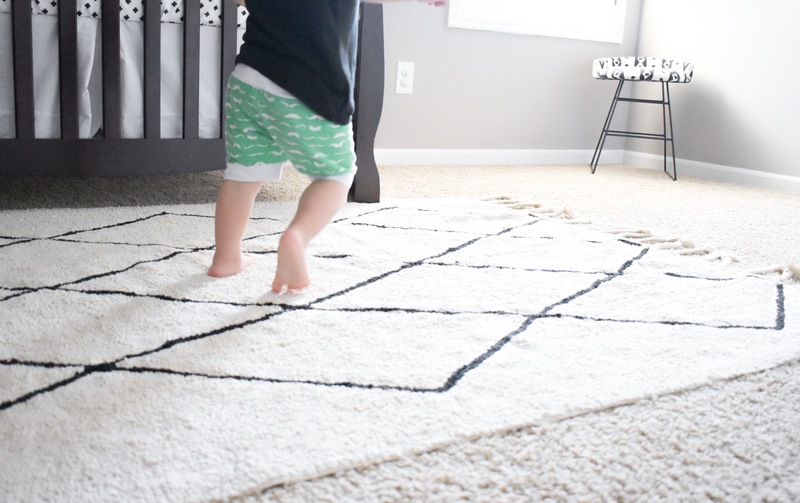 Pin the best rugs for baby nursery for later! I have heard so many wonderful things about this company and their rugs! I love that they are machine washable. As a momma of a “spitter-upper” you can’t beat it!! Love the nursery decor. Great post! My son spit up quite a bit, too. He was a reflux baby, which is definitely rough. He outgrew it around age 1, though. 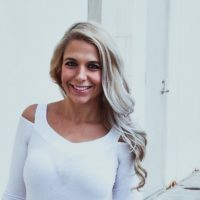 So there is hope! 😉 I’m hoping our daughter doesn’t have the same issue! I can totally relate on the hardwood! We have it on our main level and I used to tiptoe around when my son was a little baby! I TOTALLY agree that having a baby makes you so much more aware of what you buy. I was never an organic purchaser before I had my son but now most everything I buy is organic. Oh and the rug is fabulous as well!! I’ve been thinking about getting a rug for my daughters nursery. This is such a good selection ? 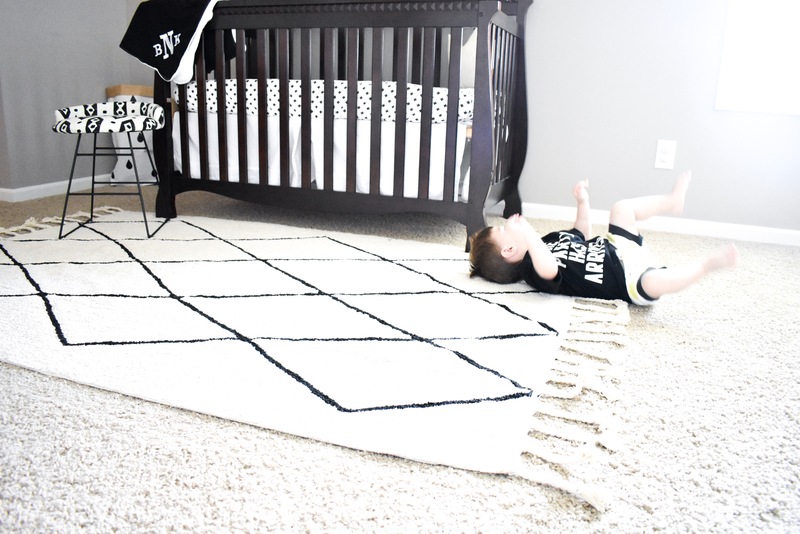 They have some great nursery rugs! I especially like the more neutral ones that can be moved around the house, too. I’m always redecorating around here! How cute! Babies are so fun.I am a huge rug person so I will have to give these guys a look. Thanks. Love that rug! And I love the idea that it can be used elsewhere as well! And machine washable is a must! Thank you, Jasmine! That definitely describes my style! This rug looks so soft and cozy! 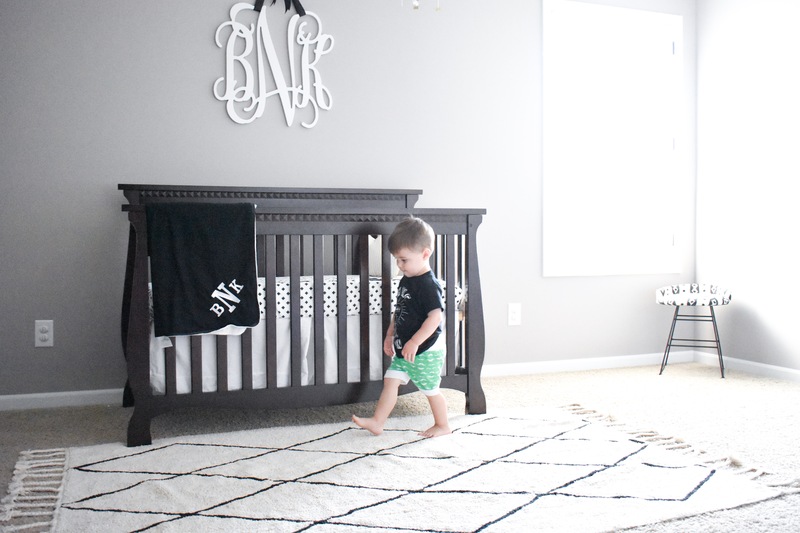 Your nursery is adorable. Thanks so much, Julie! I can’t wait for our little girl to be here and put it to the test! I need to get a new rug. This one is so pretty. Thank you, Katie! I love how versatile this one is. I can see us using it in a lot of different rooms over the years! 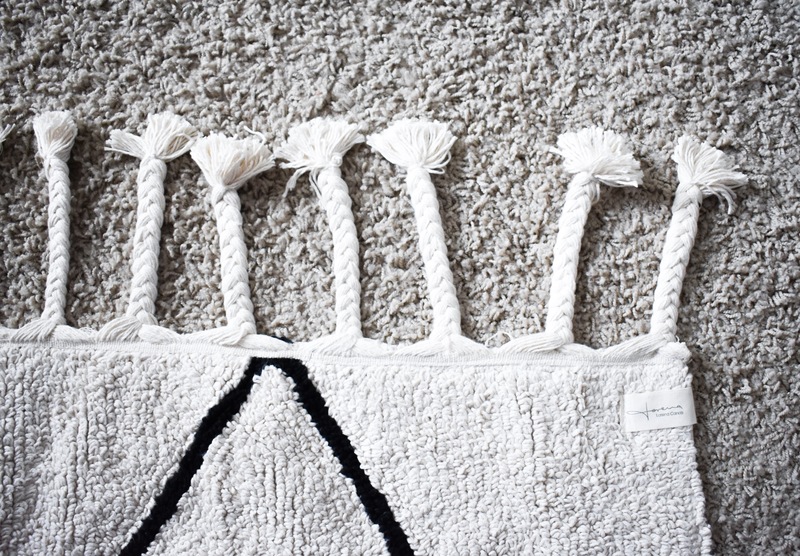 This rug is super cute and trendy! I am looking for a new one for my son, thank you! Thank you, Dani! You should definitely check out Lorena Canals if you haven’t already. They have a lot of great kid-friendly rug options. I need to get one for my son’s room, too! Thank you so much, Laura! That is very kind of you. I’m so excited for her to actually get to use her room!